Containers are going to be a key part in any organization’s transformation strategy. 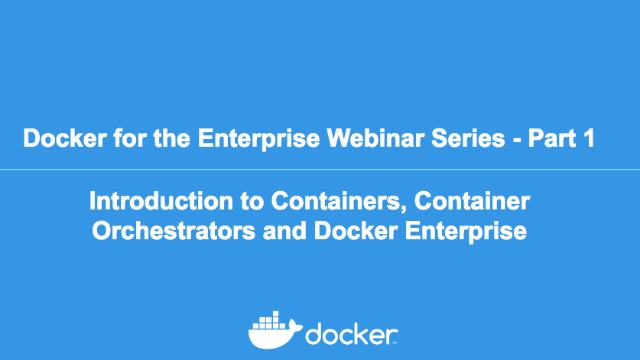 In this webinar we will introduce Linux and Windows Containers, the role and the features of a Container Orchestrator (such as Docker Swarm or Kubernetes), and provide an overview of how the Docker Enterprise can help organizations accelerate the journey to containerization. Docker Enterprise has been designed around three core pillars: Choice, Agility and Security. In this webinar, we talk in detail about the infrastructure and application choice associated with Docker Enterprise. Learn what you should be evaluating and how containers will be essential to powering your next phase of digital transformation. - The state of the cloud and container platform markets heading into 2019: what’s driving all this digital transformation? Containers have evolved into a transformative technology for application development and portability, but containers alone are not sufficient for meeting today’s enterprise requirements. In IDC’s recent Container Infrastructure Survey, over 76% of enterprises surveyed stated they use containers in production for mission critical apps, with 83% of container deployers using containers on multiple public clouds. In this webinar, Docker and guest speaker IDC Research Manager Gary Chen will discuss why companies are turning to container platforms to support increasingly diverse IT environments, bolster security and governance, and power digital transformation initiatives - from cloud migration and application modernization to microservices. The coming end-of-support for Windows Server 2008 in January 2020 leaves IT organizations with few viable options to secure their legacy applications and data. Past approaches to handling end-of-support - purchasing extended support, refactoring applications, or reposting VMs - are no longer economically viable for orgs that want to reduce legacy maintenance costs by up to 50% and boost innovation spend. Join this webinar to learn how Docker’s Windows Server Application Migration Program can drastically reduce your cost to migrate and manage legacy applications, while providing a platform for continuous innovation going forward. This webinar will examine the economic impact of migrating your legacy Windows Server applications and help you make an ROI-driven decision. Franklin American Mortgage, a Citizens company, set their sights on creating a culture that promotes fast-fail, atomic workloads for rapid development, testing, and release cycles. This metamorphosis began with setting behavior expectations and implementing Docker Enterprise. By utilizing the container platform as the underpinning for its software development lifecycle, Franklin American Mortgage is able to quickly, and automatically create the environments and resources we need at will. That change in turn promoted the desired culture of tackling work at the most atomic level. - Establish a secure software build workflow, all the way from development to production. Are you running Microsoft Windows Server 2008 or 2003 for your business critical applications, like many enterprises? Server 2008 will reach End of Support in January 2020 and with that no more security and maintenance patches without costly alternatives. Learn how to simplify your migration! Security for Public Sector with Docker Enterprise - the only FIPS certified containerization platform on the market. If you’re a CISO, ISSO, or a security professional itching to learn more about the benefits containers provide for your agency or programs security posture, than this webinar is for you! Come learn about how Docker Enterprise provides a secure container platform and software lifecycle management for all your applications and how Docker can help your agency satisfy FISMA and other regulatory requirements. New capabilities and new ways to help organizations containerize and modernize their Windows application portfolio. Containers deliver value to applications of all types - from traditional, monolithic apps to microservices and new innovative areas like data science, AI/ML and Edge computing. These benefits are not limited to Linux applications as Windows Server applications continue to represent about half of enterprise applications out there. In this webinar, we'll preview some new technology and solutions from Docker that helps bring Windows Server applications to the forefront of container strategies. We'll highlight new capabilities in Docker Enterprise and new ways to help organizations containerize and modernize their Windows application portfolio. In this webinar you'll learn how to take an application which is manually deployed onto Windows Server 2003, and migrate it to Docker. Then you can run the application in a container on Windows Server 2016 on bare metal or a virtual machine in the data center, or in any cloud. And developers can run the exact same version of the app using Docker for Windows on their Windows 10 laptops. This webinar focuses on how Docker can help you secure your application lifecycle on Microsoft Azure. Join us to review how you can leverage Microsoft Visual Studio Team Services (VSTS) to push images into the Docker Trusted Registry and using containerized VSTS build agents with the Docker Universal Control Plane. In this webinar you'll learn how to take an app which is manually deployed onto Windows Server 2003, and migrate it to Docker. Then you can run the app in a container on Windows Server 2016 on bare metal or a VM in the datacenter, or in any cloud. And developers can run the exact same version of the app using Docker for Windows on their Windows 10 laptops. In this webinar, we will demonstrate the Docker Enterprise Edition container platform together with Microsoft Azure to show you how to deliver applications faster, more securely, and at lower cost. Learn how the secure software supply chain in Docker Enterprise works with Windows apps. We'll take an old ASP.NET WebForms app and a new .NET Core web API and deploy them securely to the Docker platform. You'll learn how to secure every step of your delivery pipeline, and see how it works with old and new Windows applications - with no code changes. Build, Manage and Secure Your Apps Anywhere. Your Way. Docker unlocks the potential of your organization by giving developers and IT the freedom to build, manage and secure business-critical applications without the fear of technology or infrastructure lock-in. By combining its industry-leading container engine technology, an enterprise-grade container platform and world-class services, Docker enables you to bring traditional and cloud native applications built on Windows Server, Linux and mainframe into an automated and secure supply chain, advancing dev to ops collaboration and reducing time to value.